LAS VEGAS, Jan. 3, 2017 /PRNewswire/ -- Humaneyes Technologies, a pioneer in the development of 3D modeling and virtual reality (VR) solutions, announces March 7, 2017, as the first commercial availability of its much-awaited Vuze camera and its purpose built VR Studio software. At CES, the company is also announcing two new partnerships with VisiSonics, a leading 3D audio provider to add advanced 3D audio capabilities to the Humaneyes VR Studio software and with WakingApp and its ENTiTi AR/VR creator that provides easy to use virtual & augmented reality editing capabilities for non-programmers. The combination of technologies provides an end-to-end ecosystem for the creation and sharing of accurate, true-to-life 3D VR content. At launch, the Humaneyes VR Studio software will include the advanced 3D audio capabilities of VisiSonics' new software suite RealSpace™ 360 Cinema. For the first time in a consumer product, the solution allows virtual placement of sound anywhere in 3D space with pinpoint accuracy, creating the perception of real source direction, distance, depth, and movement relative to the listener. In addition, it will use VisiSonics' software to convert recordings from the VUZE's microphones into ambisonics. The overall 3D audio capabilities recreate the auditory ambiance of the environment, creating a completely immersive audio-visual experience. "The influx of user generated VR content, made possible by the Vuze camera, will stimulate adoption of VR headsets across the industry," said Jim Malcolm, General Manager of Humaneyes Technologies. "These new owners of VR headsets can now create immersive 3D-360 VR experiences, complete with advanced 3D audio and AR integration, without having to learn complicated computer programming languages." When watching 360-degree video in a VR headset, a flat, two-dimensional experience simply isn't enough. True VR requires 3D-360, which is made possible through the Humaneyes ecosystem, marking a paradigm shift in the industry. 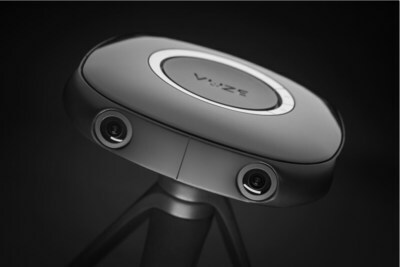 An honoree in the 2017 CES Innovation Awards and winner of the prestigious Chicago Athenaeum Good Design Award, the Vuze Camera is the first prosumer VR camera complete with a consumer ready price tag. Advanced 3D-360 capture technology incorporates 8 Full HD cameras and an easy-to-use 'set and shoot' form-factor generating 4K per eye resolution in an open industry MPEG 4 3D-360° VR video format. The Humaneyes VR Studio software uses powerful algorithms that automatically engage sophisticated processing and editing functions such as camera calibration, vignette correction, fisheye and perspective control, white balance and exposure adjustment as well as the stereo alignment for consistent parallax. Working in harmony between the hardware and software the Humaneyes VR Studio, at a touch-of-a-button, assembles a true VR experience in real-time (one minute of processing for one minute of footage). Providing even more utility and creative interaction with VR content, the Humaneyes VR studio will also incorporate ENTiTi, WakingApp's DIY Virtual & Augmented reality creation tools, which provides the ability to create rich, multilayer and interactive VR content that can be integrated with 3D 360 footage shot with the Vuze camera. The ENTiTi Creator utilizes an innovative drag-and-drop interface and cloud-based system for non-programmers to add 3D objects, video, sound and pictures into the Humaneyes VR studio and publish it instantly, anywhere. "The partnership and new capabilities we have announced at CES are just the beginning of an ever expanding VR ecosystem. Throughout 2017, we will announce new capabilities and services designed to democratize the creation and sharing of 3D-360 VR content, putting true VR creation within reach of prosumers and consumers alike," added Malcolm. Price: At just $799.95 the camera is within reach of many consumers, professional moviemakers and videographers alike. Ease-of-use: The camera's simple set-and-shoot design quickly integrates with the supplied software's single click interface providing near real-time processing (one minute of processing for one minute of footage) eliminating the need for lengthy or complicated post-production. Quality: On current VR headsets, the Vuze camera offers the same level of 3D 360 quality experienced with other 3D-360 camera systems but at a fraction of the cost. Size: The highly portable, lightweight design of the Vuze camera brings VR content creation to the realms of point and shoot photography; and even fits in most trouser pockets. No bulky rigs or sophisticated equipment is required. Full technical specs of the Vuze camera and Humaneyes VR Studio software studio can be seen here. Examples of content created by the Vuze camera can be viewed here. If you watch online, without a headset, you will see the 2D quality; a VR headset is required to experience movies in true 3D. The Vuze camera was created by Humaneyes Technologies, an early pioneer of 3D modeling and VR technologies. Founded in 2000, it currently holds over 70 patents in various fields of 3D associated technologies. Vuze camera was created after more than two years of research and development at its headquarters within the Hebrew University in Jerusalem. The company's leadership includes industry visionaries such as Prof. Shmuel Peleg, a world expert in computer vision and image processing and Benny Landa, known as the father of digital printing and former founder and CEO Indigo Digital Printing acquired by HP in 2002.